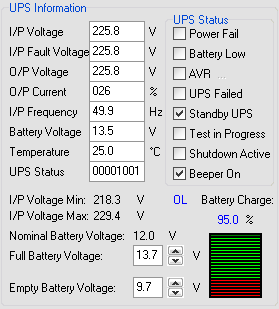 19.01.16 New version of UPS Assistant 2.4.2.114 is released. 27.11.15 New version of UPS Assistant 2.4.1.109 is released. 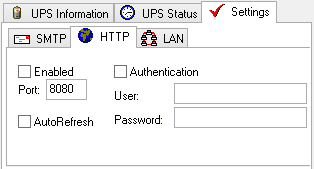 06.09.15 New version of UPS Assistant 2.4.0.97 is released. 18.04.12 New version of UPS Assistant 2.3.4.82 is released. 16.03.12 New version of UPS Assistant 2.3.3.80 is released. 11.07.10 New version of UPS Assistant 2.3.2.76 is released. 18.05.10 New version of UPS Assistant 2.3.0.71 is released. 31.01.10 New version of UPS Assistant 2.2.0.64 is released. 18.09.09 New version of UPS Assistant 2.1.1.56 is released. 15.09.09 New version of UPS Assistant 2.1.0.55 is released. 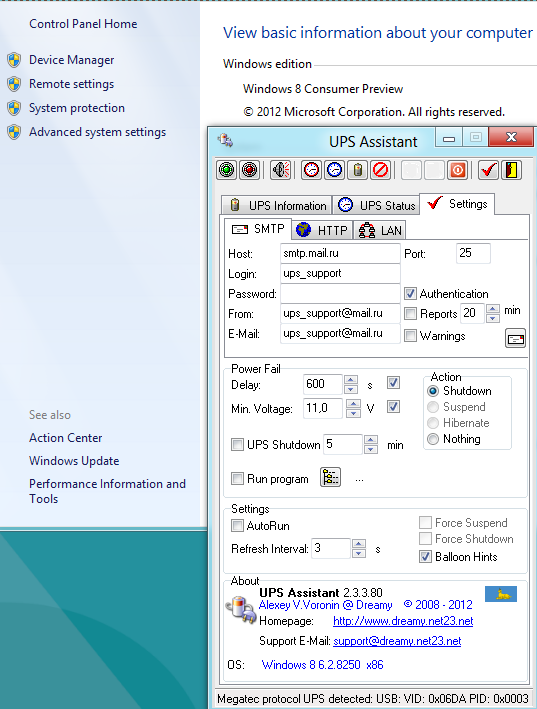 20.07.09 New version of UPS Assistant 2.0.2.54 is released. 18.04.09 New version of UPS Assistant 2.0.1.49 is released. 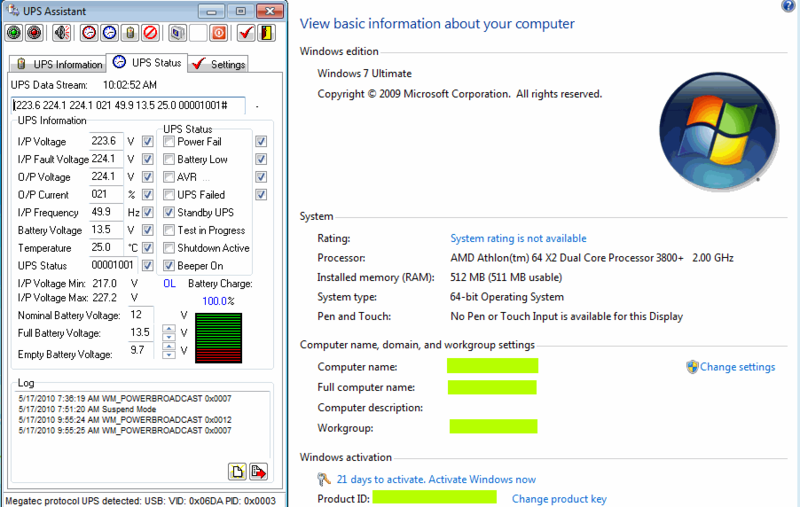 15.01.09 New version of UPS Assistant 1.3.0.33 is released. 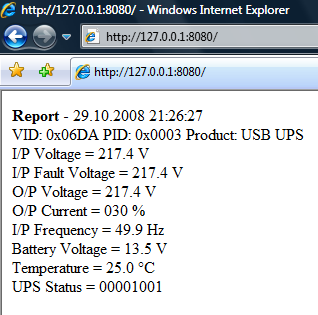 29.08.08 New version of UPS Assistant 1.2.0.26 is released. 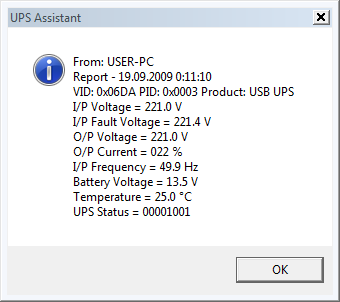 14.07.08 New version of UPS Assistant 1.2.0.19 is released. 07.07.08 Leave your feedback about this program in website! UPS Assistant je maly nastroj, ktery nevytezuje systemove prostredky PC a pritom monitoruje radu udaju z UPS. Celou dobu bezi na pozadi systemu s ikonou v oznamovaci oblasti hlavni listy. Diky tomu mate vsechna potrebna data o zaloznim zdroji stale k dispozici. Zobrazi napeti, frekvenci, nabiti baterii, teplotu, status UPSky, kolik minut na ni muzete jeste jet atd. Navic si poradi s testovanim baterii UPS. Na strankach programu najdete i list podporovanych UPS zarizeni. You will receive information on the development and roadmap of UPS Assistant project, notifications about every new release and instructions on how to get it. 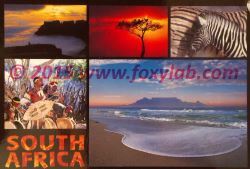 Click on the link below to join UPS Assistant mailing list! 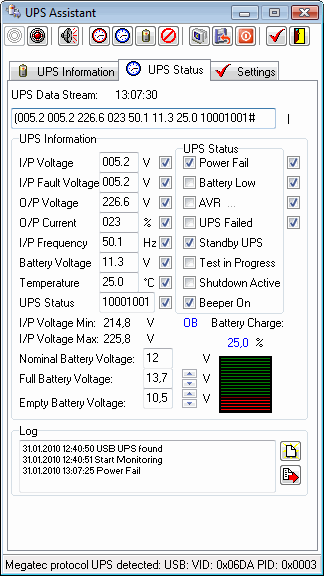 UPS Assistant is intended for monitoring of status of the Uninterruptible Power Supply (UPS), connected to a computer through USB- or COM-port and supporting the Megatec/Centralion protocol (Ippon, Mustek, Sven, Inelt). 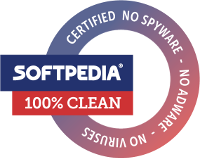 Requires: Windows 2000, XP, 2003, Vista (x86 and x64), Windows 7/Windows Server 2008 R2 (x86 and x64), Windows 8/Windows Server 8 (x86 and x64). UPS Assistant is provided "as is", with no warranties whatsoever. UPS Assistant is distributed under CC BY-ND 3.0 license ("Attribution-NoDerivs"). 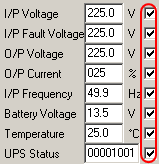 Also VID/PID UPS can be specified with a command line /Ivvvv:pppp, where vvvv - 4-digit hexadecimal number that corresponds VID UPS and pppp - 4-digit hexadecimal number that corresponds PID UPS. For example, "C:\Program Files (x86)\Alexey V.Voronin\UPS_Assistant\UPSAssistant.exe" /I12A5:B678 - VID:0x12A5, PID: 0xB678. 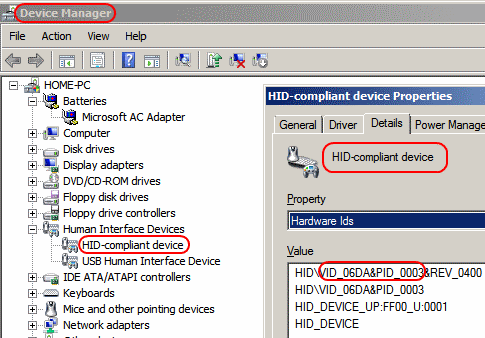 To determine VID/PID your UPS can use the "Device Manager" Windows. In the list of devices UPS will be presented in the section "Human Interface Devices" as "HID-compliant device". In the "Properties" of the device open the tab "Details" and see the property "Hardware Ids" - the first line of the form HID\VID_06DA&PID_0003..., where 06DA - VID, and 0003 - PID UPS. The button to send test messages. When successfully sent email to the status bar displays the message "Report sending O.K.". If you specify an incorrect user name or password, the status bar displays the message "Username and Password not accepted" - for Gmail. 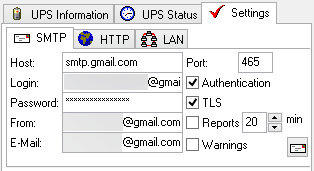 If not enabled mail server authentication is required, the status bar displays the message "Authentication Required" - for Gmail. 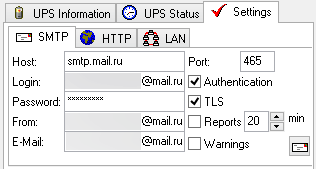 If you send are given various fields Login and From, and mail server expects that they will be the same, the status bar displays the message "sender address must match authenticated user" - for the Mail.Ru. * possibility to turn off the tooltips - "Balloon Hints"
If the UPS is connected to a COM-port, then when you first start the program requests the number of COM-port . If the "UPS Rating Information" command ( "F") is not supported or is disabled, the program requests that the battery voltage . 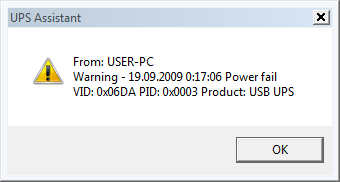 If the UPS is supported, then hint appears: USB: , COM: . "Exit" - exit from program. When you click the left mouse button on the button in the window title program does not close, but rolled in the system tray. + added the ability to disable tooltips - "Balloon Hints"
* fixed a bug than caused the loss of connection with UPS when you press buttons "Stop" and "Start"